Trump departs the White House in Washington. US President Donald Trump and France's Emmanuel Macron agreed on Saturday on the need for more European defence spending, papering over an earlier Trump tweet that had described Macron's call for a European army as "very insulting". Seated on gilded chairs in the ornate presidential palace, Macron placed his hand on Trump's knee and referred to him as "my friend", while Trump kept more distance, although he also talked up common ground on an issue that had caused friction. "We want a strong Europe, it's very important to us, and whichever way we can do it the best and more efficient would be something we both want," said Trump. Macron echoed those sentiments, saying he wanted Europe to bear a greater share of the defence costs within NATO, a point he has made repeatedly since taking office, alongside his ambitions for Europe to have its own military capability. "That's why I do believe my proposals for European defence are totally consistent with that," Macron said in English. Discussing the growing dangers from cyber-hacking, meddling in electoral processes and the US decision to withdraw from a missile treaty, Macron said Europe needed to protect itself against China, Russia "and even the United States". "Faced by Russia, which is on our borders and which has shown that it can be threatening... we need to have a Europe that can better defend itself by itself, without depending solely on the United States." "Very insulting, but perhaps Europe should first pay its fair share of NATO, which the US subsidizes greatly," Trump said on Twitter. The Elysee said the misunderstanding, which it said had been caused by "exaggerated" US press reports, was cleared up during more than an hour of talks it described as "substantial" and "very constructive". "We had a great discussion and we are aligned," the Elysee quoted Trump as saying during the meeting, which covered trade, defence, Syria and the fallout from the murder in Istanbul last month of Saudi journalist Jamal Khashoggi. After a lunch with Macron and their wives, Melania and Brigitte, Trump was scheduled to visit an American cemetery at Belleau Wood, east of Paris. But he cancelled the trip due to the weather. White House chief of staff John Kelly, a retired four-star general, and General Joe Dunford, the chairman of the Joint Chiefs of Staff, will attend the ceremony instead, the White House said. On Sunday, after a solemn commemoration at the Arc de Triomphe to honour the armistice centenary, Trump is scheduled to visit an American cemetery at Suresnes, on the western outskirts of the capital, where he will make formal remarks. His trip comes just days after congressional elections delivered results that will complicate his next two years. 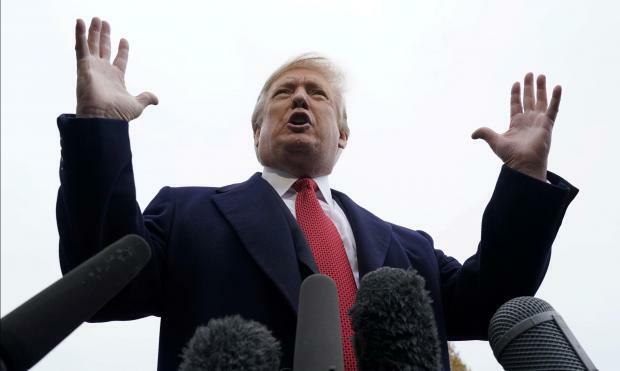 While Republicans slightly expanded their majority in the US Senate, they lost control of the US House of Representatives to Democrats who may use their newfound power to launch investigations into Trump and stymie his agenda. While the talks with Trump covered trade and foreign policy, it was not clear if they touched on European concerns about Trump's plans to withdraw the United States from the 1980s Intermediate-Range Nuclear Forces Agreement. Macron told Europe 1 radio that the "main victim" of the US withdrawal from the INF accord was Europe and its security.